Amazon.com description: Product Description: Emotional Intelligence was an international phenomenon, appearing on the New York Times bestseller list for over a year and selling more than five million copies worldwide. Now, once again, Daniel Goleman has written a groundbreaking synthesis of the latest findings in biology and brain science, revealing that we are âwired to connectâ and the surprisingly deep impact of our relationships on every aspect of our lives. Far more than we are consciously aware, our daily encounters with parents, spouses, bosses, and even strangers shape our brains and affect cells throughout our bodiesâdown to the level of our genesâfor good or ill. 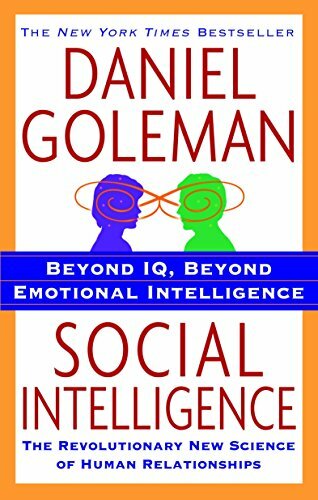 In Social Intelligence, Daniel Goleman explores an emerging new science with startling implications for our interpersonal world. Its most fundamental discovery: we are designed for sociability, constantly engaged in a âneural balletâ that connects us brain to brain with those around us. Our reactions to others, and theirs to us, have a far-reaching biological impact, sending out cascades of hormones that regulate everything from our hearts to our immune systems, making good relationships act like vitaminsâand bad relationships like poisons. We can âcatchâ other peopleâs emotions the way we catch a cold, and the consequences of isolation or relentless social stress can be life-shortening. Goleman explains the surprising accuracy of first impressions, the basis of charisma and emotional power, the complexity of sexual attraction, and how we detect lies. He describes the âdark sideâ of social intelligence, from narcissism to Machiavellianism and psychopathy. He also reveals our astonishing capacity for âmindsight,â as well as the tragedy of those, like autistic children, whose mindsight is impaired. The answers to these questions may not be as elusive as we once thought. And Goleman delivers his most heartening news with powerful conviction: we humans have a built-in bias toward empathy, cooperation, and altruismâprovided we develop the social intelligence to nurture these capacities in ourselves and others. About: Redefines the nature of human relationships and its impact on every aspect of daily life, bringing together the latest research in biology and brain science to reveal how one's daily encounters shape the brain and affect the body. About: Explores the nature of human relationships, finding that humans are 'wired to connect,' and bringing together the latest research in biology and neuroscience to reveal how one's daily encounters shape the brain and affect the body. About: Redefines the nature of human relationships and its impact on nearly every aspect of daily life, combining the latest research in biology and brain science to reveal how daily encounters shape the brain and affect the body. About: The best-selling author of Emotional Intelligence redefines the nature of human relationships and its impact on every aspect of daily life, bringing together the latest research in biology and brain science to reveal how one's daily encounters shape the brain and affect the body, from daily mood to the immune response.